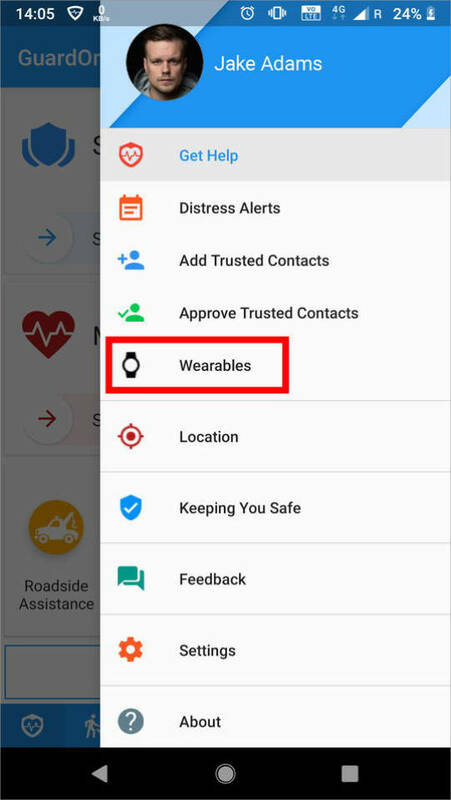 In GuardOn app's main menu, select the "Wearables" option. Tap the (+) button on the Wearables screen. 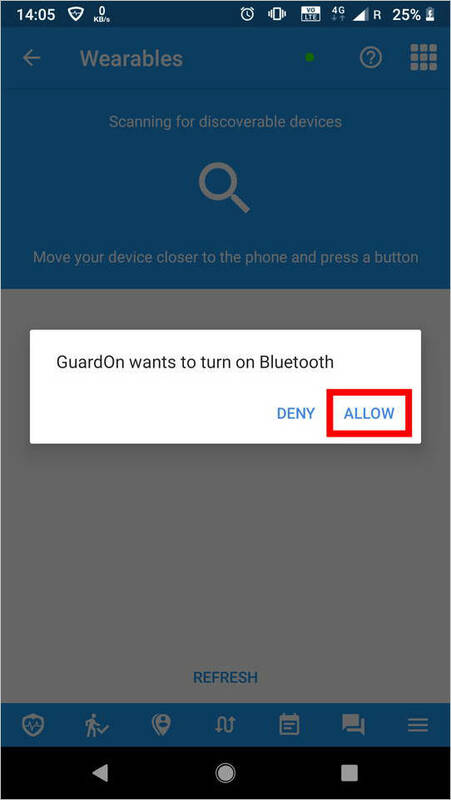 You may be asked to enable Bluetooth, tap Allow. 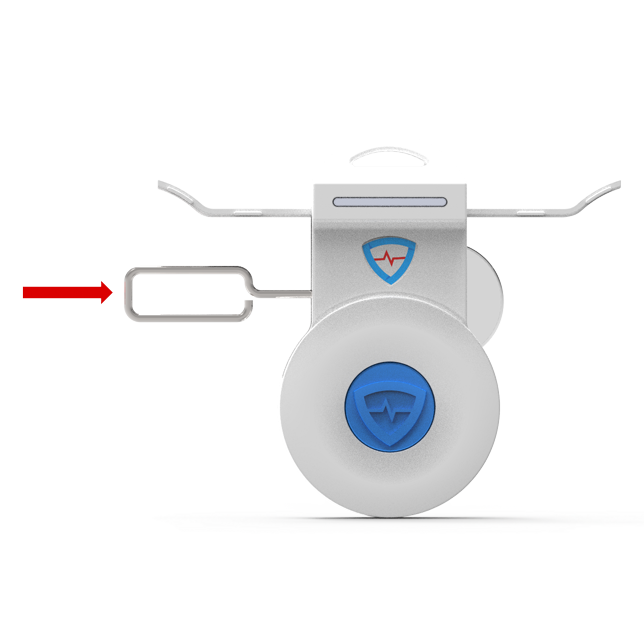 Press both blue and red buttons together once on your GuardOn Freedom Key. The blue LED on the wearable will start blinking for 25 seconds. Your Freedom Key will appear in the list. If you don't see it, tap Refresh to scan again. Once discovered, tap your Freedom Key's entry in the list to pair it. You'll now see the Wearable Details screen with Connected status—means your Freedom Key is paired! * If you would like to, you may change the name of the wearable by tapping the edit icon on the Wearable Details screen. The blue LED on your Freedom Key will stay on for 3 seconds, then it'll turn off automatically. 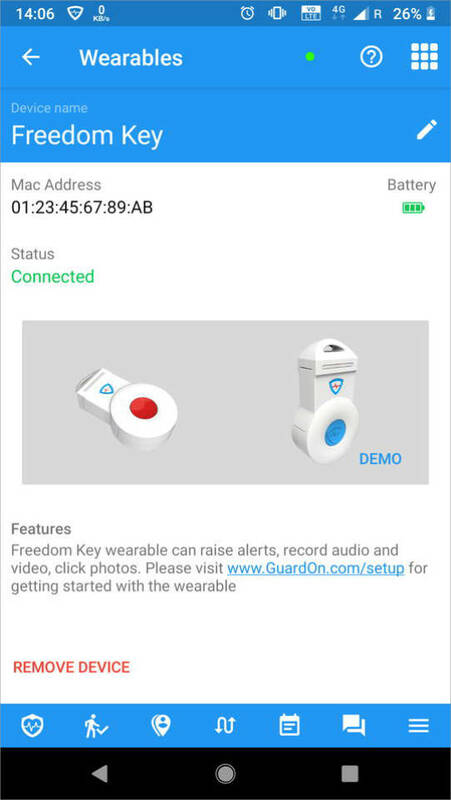 You can pair additional Freedom Keys and other GuardOn wearables with your phone following the same procedure. Press and hold both Safety and Medical Alert buttons on your Freedom Key for at least 3 seconds. The red and blue LEDs on your Freedom Key will blink alternately. 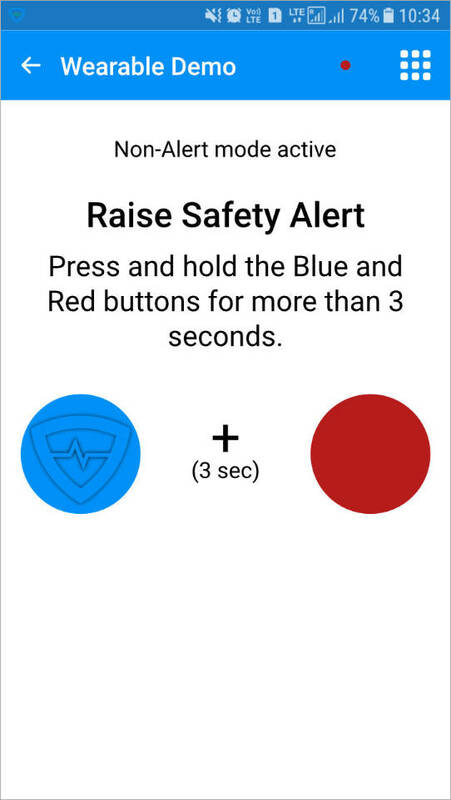 This is an indication that (a) the Safety Alert has been sent (red LED blinking), and (b) Audio is being recorded (blue LED blinking). 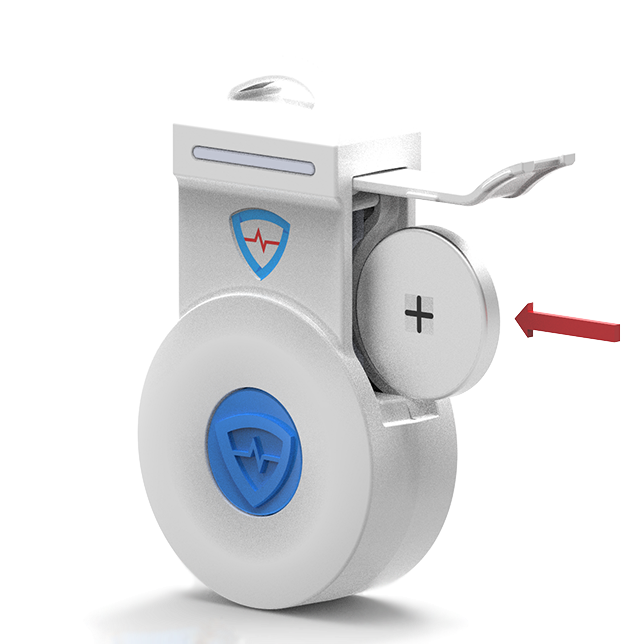 Press and release both Safety and Medical Alert buttons on your GuardOn Freedom Key 3 times. The red and blue LEDs on your Freedom Key will blink alternately. This is an indication that (a) the Medical Alert has been sent (red LED blinking), and (b) Audio is being recorded (blue LED blinking). The Safety Button on your Freedom Key is the blue button with the GuardOn logo. Press and release it once. This starts the audio recording on your GuardOn Mobile App. As long as the blue LED on your Freedom Key wearable is blinking, it is an indication that audio is being recorded. The maximum duration of audio recording is determined by your configuration in Settings screen (Menu -> Account -> Settings) of your GuardOn Mobile App. You can stop this audio recording before this configured duration elapses by quickly pressing and releasing both Safety and Medical buttons on your Freedom Key. When the blue LED stops blinking, recording stops and the recorded audio is sent to your Responders. 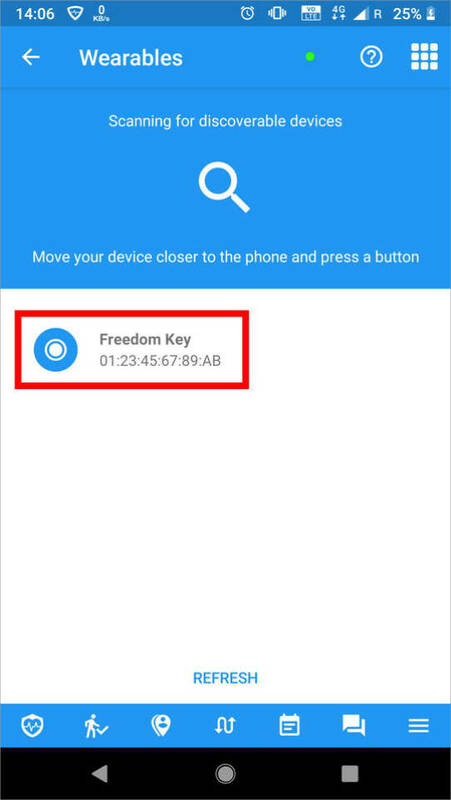 By using your Freedom Key, you may record and send audio again and again after each clip has been recorded and sent. Press and release it twice. This starts the video recording on your GuardOn Mobile App. Make sure the camera of your smartphone is not covered when you record video. As long as the blue LED on your Freedom Key wearable is blinking, it is an indication that video is being recorded. The maximum duration of video recording is determined by your configuration in Settings screen (Menu -> Account -> Settings) of your GuardOn Mobile App. You can stop this video recording before this configured duration elapses by quickly pressing and releasing both Safety and Medical buttons on your Freedom Key. When the blue LED stops blinking, recording stops and the recorded video is sent to your Responders. By using your Freedom Key, you may record and send video again and again after each clip has been recorded and sent. Press and release it three times. This captures a photo on your GuardOn Mobile App. Make sure the camera of your smartphone is not covered when you capture a photo. Captured photo is automatically sent to the Responders. By using your Freedom Wearable, you may capture photos again and again after each one has been sent. 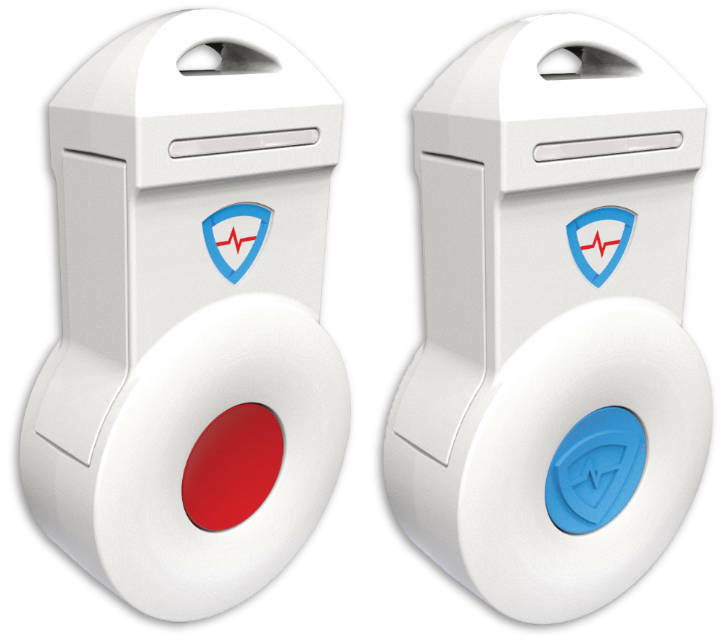 Press and release both the Safety and Medical alert buttons once quickly to wake up your Freedom Key. Press and release the Safety Button once. This starts the audio recording. As long as the blue LED on your Freedom Key is blinking, it is an indication that audio is being recorded. The maximum duration of audio recording is determined by your settings in the Settings screen (Menu -> Account -> Settings) of your GuardOn Mobile App. When the blue LED stops blinking, recording stops and the recorded audio is stored in your smartphone's default media app. Press and release the Safety Button twice. This starts the video recording. As long as the blue LED on your Freedom Key is blinking, it is an indication that video is being recorded. The maximum duration of video recording is determined by your settings in the Settings screen (Menu -> Account -> Settings) of your GuardOn Mobile App. When the blue LED stops blinking, recording stops and the recorded video is stored in your smartphone's default media app. Press and release the Safety Button three times. This captures a photo on your smartphone. The captured photo is stored in your smartphone's default media app. Go to the "Wearable" screen (Menu -> Preferences -> Wearable) on your GuardOn Mobile App. Look for the entry for your Freedom Key. The battery level of your Freedom Key will be shown in that entry. It will also be shown in the Wearable Details screen for your Freedom Key. You can open this by tapping on your Freedom Key entry in the Wearable screen. Green: Battery level is fine. Yellow: Battery level is medium. You will need to replace the battery of your Freedom Key soon. Red: Battery level is low. You should definitely replace the battery of your Freedom Key. Replacement Battery: You can purchase the replacement battery online or at any electronics store. Ask for CR2032 coin cell battery. Bring your Freedom Key close to your GuardOn Mobile Phone. Press both buttons on your Freedom Key once. It will reconnect with your GuardOn Mobile App. Locate the entry for your Freedom Key. Tap on it to get to the Wearable Details screen. Tap on 'Remove Device' to un-pair your Freedom Key from your GuardOn Mobile App. 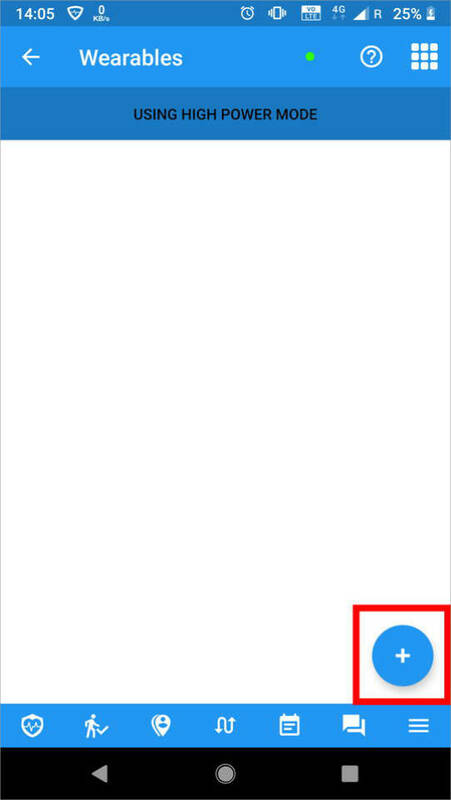 On the Wearable Details screen, tap DEMO on the Freedom Key image to launch the Demo Mode. You'll be provided instructions in both written and visual forms. Please refer to them carefully and follow along. If you make a mistake, you'll be asked to repeat the same step. Hold the Freedom Key with the blue Safety Button facing you, and the circular portion of the Freedom Key facing towards the bottom. Open the right-side battery enclosure door. Hold the battery with the positive side facing you. Slide the battery in as shown in the image. Hold the Freedom Key with the blue Safety Button facing you, and the circular portion of the Freedom Key facing towards at the bottom. Open both battery enclosure doors. Insert a pin through the hole provided on the left-side. This pushes the battery out from right. Pull the battery out. To install a new battery, follow the instructions for "Installing Battery". Do not expose your Freedom Key to water. Should you do that, we do not guarantee that water will not get in and damage the device.